Bogart would refer to those months as the happiest of his first forty years. As the head of the [Seneca Point] Gang, he would decide when the boys should go sliding down the waterfalls in the steep, narrow valleys that creased the hills above the Point, or when they should attend the butchering of a steer in a local farmer's barn. 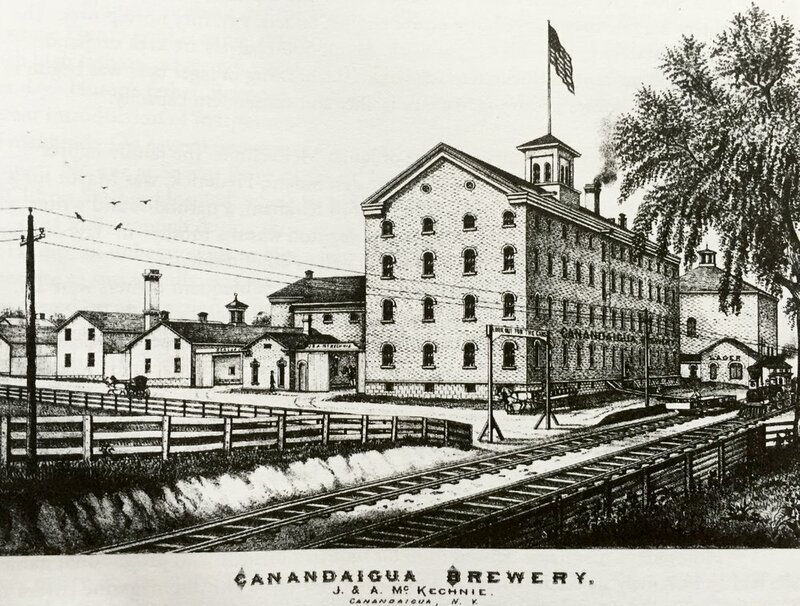 The Canandaigua Brewery made James McKechnie extremely prosperous. 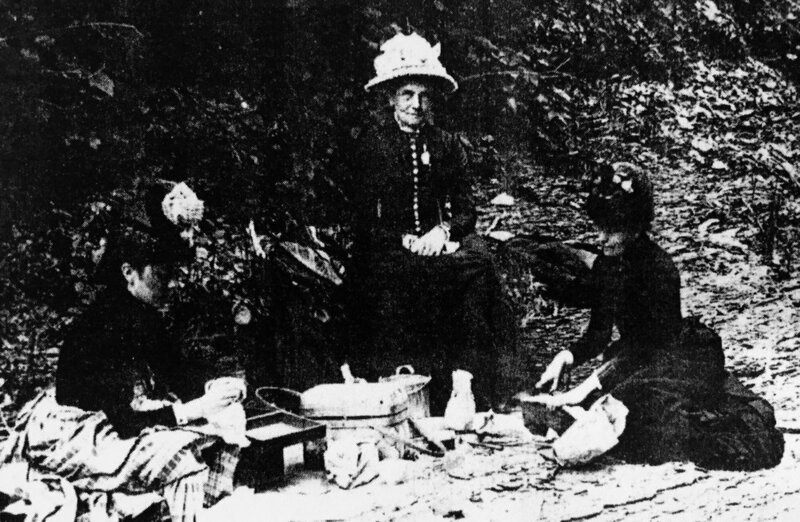 Willow Brook was home to Seneca Point's most eminent residents for over 100 years. 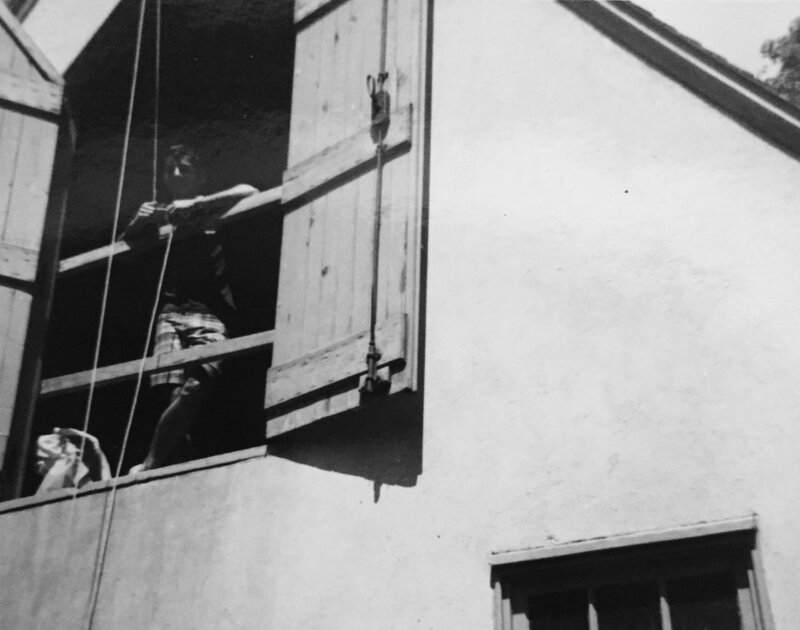 Casey Benham, son of Walt Benham, in the Hayloft in the 1960's. The mailbox turnstile has lasted over 50 years: from the Benhams to the Bennems. Seneca Point gets its name from the Seneca Nation, one of the six nations of the Iroquois, which originally settled this area and had orchards all along this side of Canandaigua Lake through the 1700’s. Unfortunately, the Seneca and American colonists found themselves on opposite sides of the Revolutionary War, and in 1779 the Sullivan Expedition came through this area intent on crushing any nascent Seneca contribution to the British war effort. The legendary birthplace of the Seneca is on Bare Hill (and South Hill) located on the Eastern shore of Canandaigua Lake directly across from Seneca Point. The excellent Ganondagan Museum and Historic Site in nearby Victor portrays the history of the Seneca people. After the Sullivan Expedition, settlers began to flood this area and take advantage of the fertile soil in the hills bordering the lake. 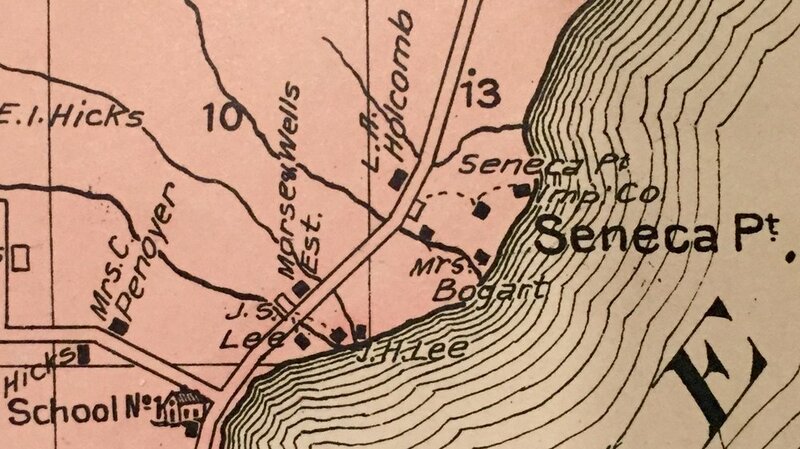 The Morse family picked up where the Seneca left off, planting apple and peach orchards in the hills above Seneca Point. Today, one can still see the terracing carved into the slopes behind Glen Hollow where orchards once stood, and walk along the old work road which climbs up the hill. In addition to orchards, Seneca Point’s history is tied to the beverage industry. Its first most prominent resident was James McKechnie who made his fortune with the Canandaigua Brewery. It was McKechnie who built the beautiful Willow Brook estate out on the point, and would later purchase the Seneca Point Hotel. It is around this time that the earliest known resident is mentioned here in the glen. Lyman Holcomb lived in a small cottage here and he often helped unload the beer barrels destined for the hotel. Occasionally, it is said, one of the barrels ‘fell off the cart’ as it were, by way of payment, and while the well-to-do were enjoying their German cotillions at the hotel across the street, another party was going on here at the Holcombs’. 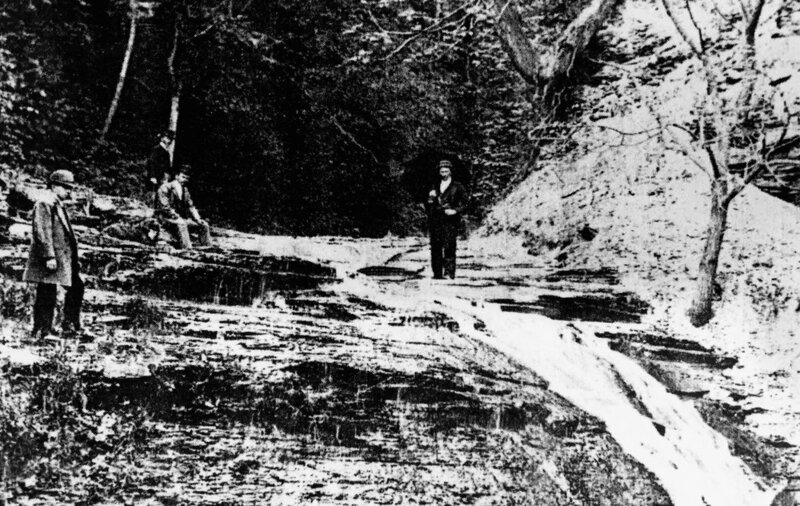 Even then the glen was a destination, and photos show Victorian tourists picnicking beside the brook and standing atop the Seneca Point Glen waterfall. In 1899 the Seneca Point Hotel burned down, and in Christmas of that same year, Humphrey Bogart was born. He was named for his mother, Maud Humphrey, who was the most famous American artist of her time, known for the cherubic faces and lacy dresses of her young models, which filled popular magazines and children’s books. Born in New York City, Bogart spent his summers growing up on Seneca Point in Willow Brook. The young Humphrey learned to sail on the lake, hiked up through the hills, and slid down the waterfall and brook here in the glen with his friends. Though he had a sometimes troubled relationship with his parents, he regarded his days on the Point as idyllic, and was greatly disappointed when the family sold the property in 1918, shifting their summer retreats to Long Island. Around this time, other cottages were beginning to spring up along the point, built by Boston architect James S. Lee who had also spent the summers of his youth here. Lee grew up in the ‘Stone Cottage’ which can still be seen just down the road at the corner of Hicks. It was next to this that he and his brother designed and built their first house, ‘Bogdanit’, which served as a showpiece and model for the other cottages that would be built here. When the small farmhouse in the glen burnt down in 1922, the new owners of Willow Brook, the Warrens, bought the property. In 1924, they had Lee build for them a spacious garage with an attached stable and caretaker cottage. Where all his other projects here were designed to be viewed from the lake, Lee designed the Willow Brook garage and cottage to be viewed from the road. Instead of following the shoreline, it followed the line of the hill, with its central section--the garage--built directly into it. Years later, local stage actor James Judson Morgan inherited the property and transformed it from a garage into a full house. A little brick schoolhouse which had stood near the corner of Hicks Road since the 1860’s would be pulled down and its fireplace, brick, and rough-hewn beams would all be integrated into the design. Morgan’s long-time friend and director, Walt Benham, then the mayor of neighboring Canandaigua, purchased the home upon its completion in 1960. Judson Morgan would travel to California, securing occasional roles in film and television throughout the seventies, but the Benham family would go on to live here for nearly thirty years. After the Benhams, the beautiful house in the glen would have a succession of owners. In the nineties and early 2000’s, the Zonnevilles kept horses in the pasture across the street, which had been a part of the property for many years. As the cottages on the point began to be turned into mansions, one of these was purchased by an oil magnate and investor, who also bought the neighboring pasture and the house which came with it. The investor turned out to be an embezzler, however, and sleepy Seneca Point woke up one morning to the sight of a fleet of FBI-issued black escalades who rolled up and seized both properties. For many years, the house stood empty, or nearly so. Its current owners, (named Bennem, but no relation to the Benhams) first discovered it over ten years ago while visiting the Finger Lakes on a country drive. They watched and waited until, after years in publishing, they felt ready for a new adventure. Securing the award-winning talents of Cultrara Associates, they embarked on a two-year renovation, bringing this unique architectural gem back to its former glory, and transforming the attached stable into a guesthouse. In November of 2017, the structure was added to the National Register of Historic Places. As with the other cottages here on Seneca Point, the owners decided it needed a name. In respect for the traditions and history of the area, they settled on: Glen Hollow.